Found the waterfall up Potrero John, and easy hike except at the very end. Looking toward Reyes Peak from Haddock Peak. Looking out to sea from Reyes Peak. 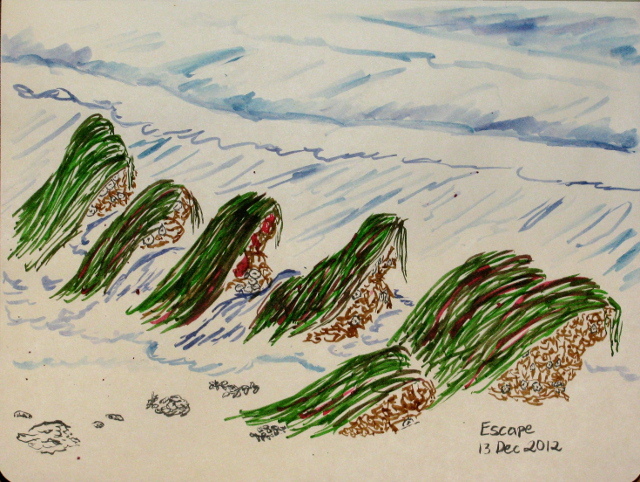 The sea grass topped rocks at low tide. 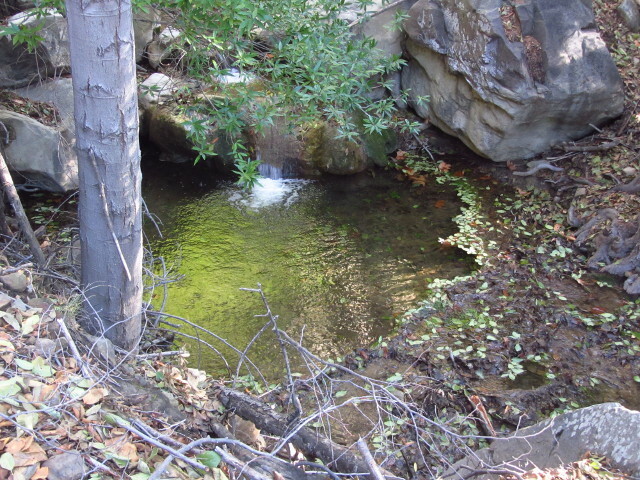 A moment of canyon views, and creek views, in the upper north fork of Matilija. 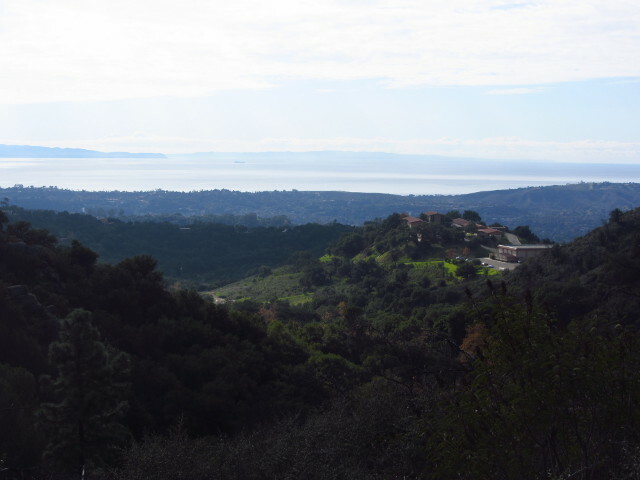 Even more views of canyon and a little ocean from the upper north fork of Matilija. A moment's rest at Knapp's Castle. 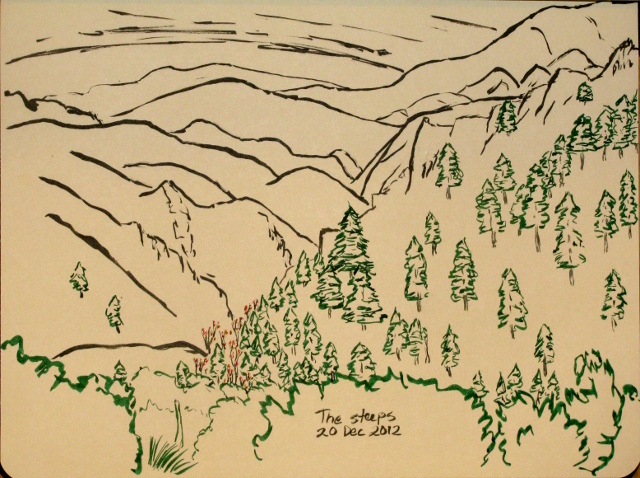 A glance across the meadow named for the tin can cabin that once occupied it in Rattlesnake Canyon. The quest to see Mission Falls flowing continued today, with success in the strictest sense that water was spilling over the rocks. I made another lazy start for the trail, which I really should stop doing. I found the road in is covered in steel plates, but the machinery that was parked near the trail before is now gone. There was plenty of parking even though this was a weekend day. Even so, I followed another car into the parking. 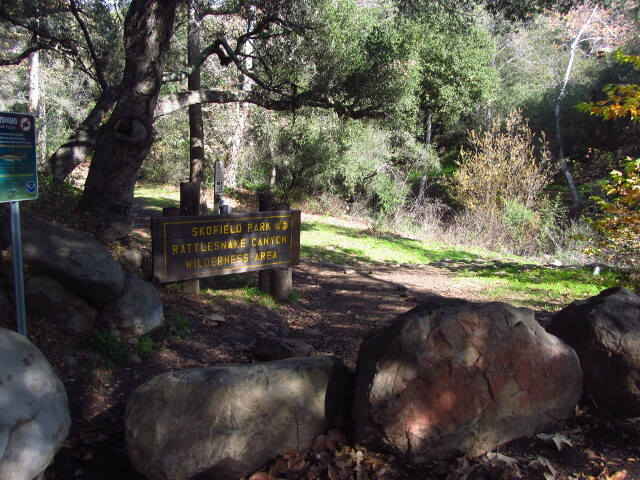 Arriving at Skofield Park to hike through the Rattlesnake Canyon Wilderness Area and Los Padres National Forest behind it. I tried to figure out if there was more water flowing now than before. Maybe a little. It was at least flowing under the bridge last time which it wasn't the time before, and that wasn't enough to have flow over Mission Falls. I passed the sign pointing out that, for my safety, various things including bikes were prohibited. I crossed the creek and passed many people out walking their dogs. The trail was muddy with a few puddles, but still offered a path of steady footing throughout. Dropping back down into the cold of the creek, I crossed again and quickly climbed to views of St. Mary's and the ocean with islands. It isn't one of those really crisp days when you can pick out rocks and trees on the distant islands, but they still do a good job of looming out of the water. Looking out at Santa Cruz and Santa Rosa through the canyon gap. 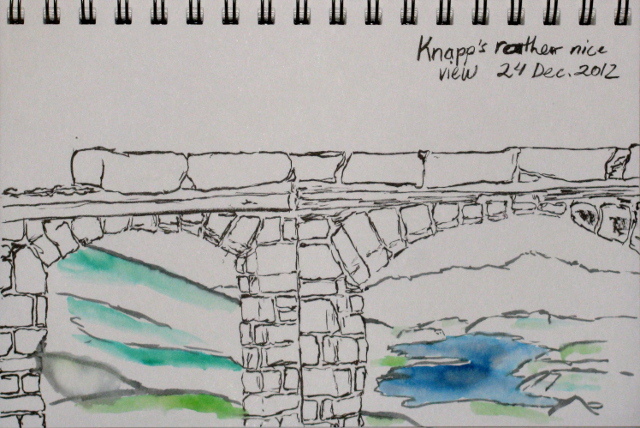 After Knapp's Castle, we continued down Camino Cielo to the east. Besides hiking up on Tunnel Trail, I think I've managed to miss this section between Knapp's Castle and Gibraltar Road. 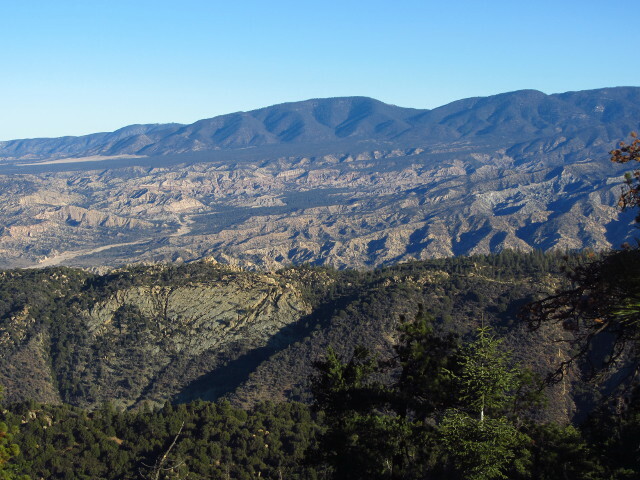 I realized that La Cumbre Peak and its fire lookout is along here. This is another place with a little extra history. I had to stop and since I was operating the wheel and pedals, so did everyone else. 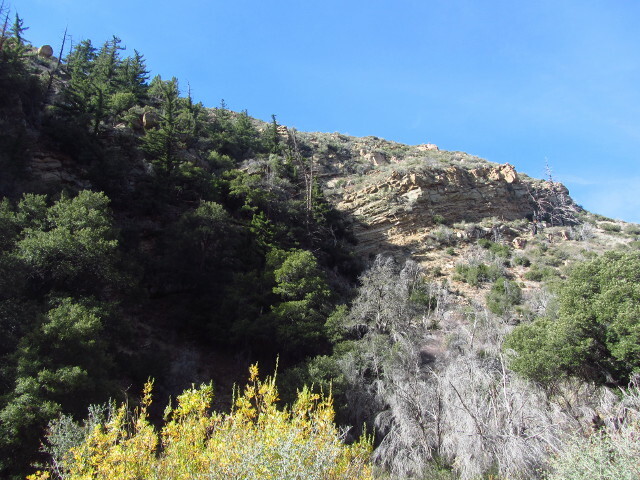 This is another very brief hike and while Knapp set himself in a spot with primarily back country views, the vegetation on the peak tends to make it good for primarily front country views, making a nice complement. We parked below the paved road that loops up to the lookout and started up past the locked gate and a foolishly parked SUV blocking it. Arrows on the pavement indicate we should keep left, so we did, walking up under the young pines along the north side of the peak. 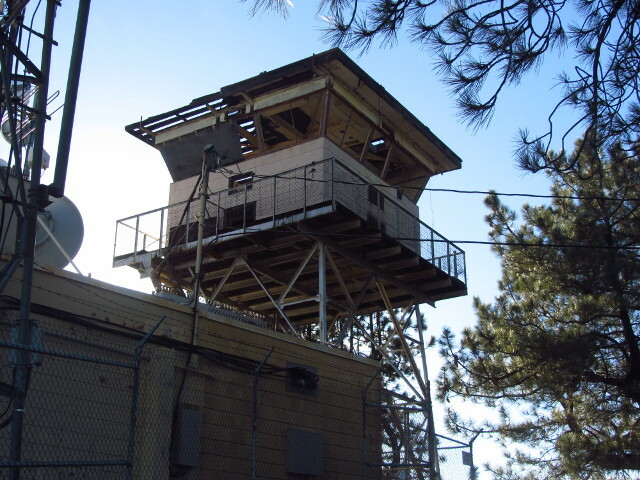 The La Cumbre Peak lookout seems to be missing a bit of the roof, but still has a storm shutter. 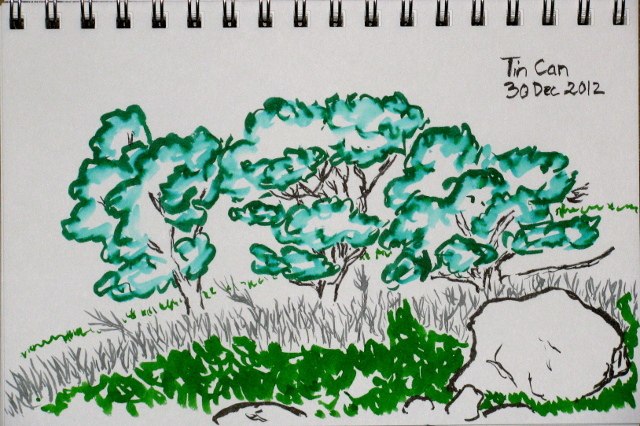 The family wanted a little walk and with bright blue, freshly washed skies and the last of the lingering grey clouds puffing out of existence in the sun, it didn't seem like the time to wander some ocean bluffs, but to head to some high place. 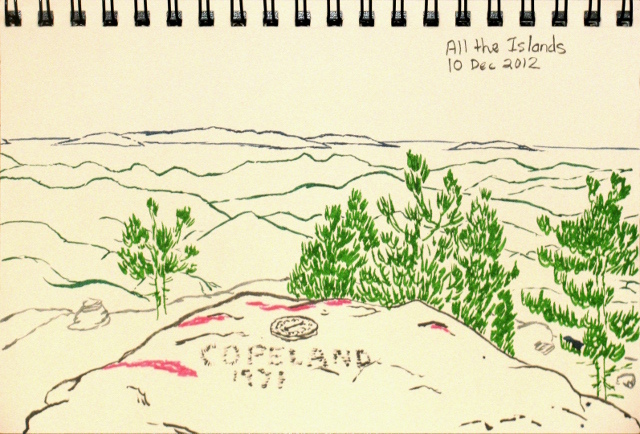 Knapp's Castle was among the suggestions, so we went there. George Knapp was a driving force in first laying down the roads we still use to access the backcountry, so it is no wonder that he knew a good spot to build his house. Somewhere below, there is a waterfall, but it is not along the maintained route and the tales of getting there describe a fair bit of work, especially considering that the route was once a road. I couldn't get anyone interested and hadn't dug out the bit of map that would be necessary, so we stuck to the very short stroll to the ruins. 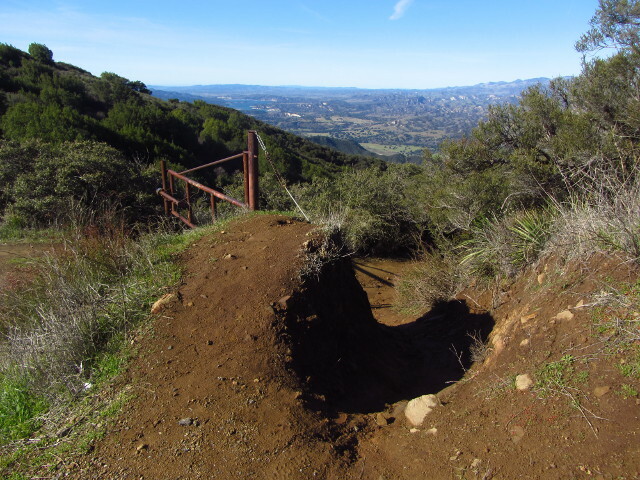 Every road that isn't open to driving by the public has to have a gate, and this is the one at Knapp's Castle. This is the second day, the first day is here. The morning was chilly and the sun wouldn't come soon enough. A bit of noodles and a packet free of MSG but also too free of dried veggies with a handful of TVP does make for a yummy breakfast, but didn't seem especially energizing over the early part of the hike. I packed up everything useful for day hiking and started up the last bit of trail. This part of trail wiggles a bit excessively like the growing vegetation has pushed it around a bit. I expect it is the least traveled section, but except for sections of a few feet, the trail is distinct. The fall leaves do try to shroud it a bit. The campsite was ice free, but I quickly found a lot of ice along the trail. Some fine, feathery ice sparkling in the sunlight. With lots of creek crossings, often without any apparent landscape derived reason, the trail makes its way up the canyon. The new leaves in the creek stack up against the old leaves that are themselves stacked up against the rotting leaves that make up a soil like barrier at the edges of pools, making an illusionary extension of the bank for unwary hikers to step on. 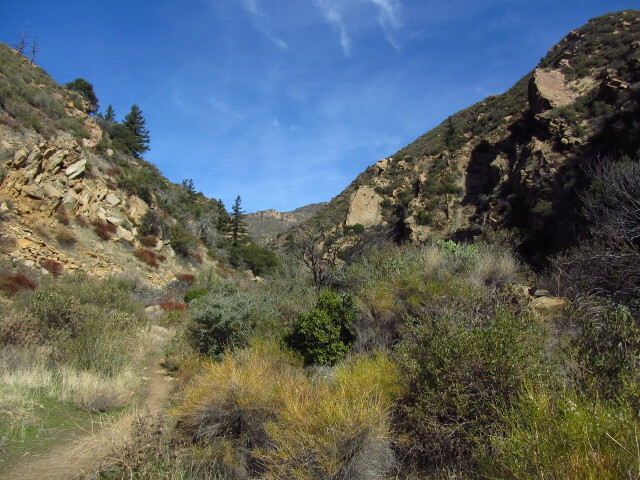 I decided to head out on a simple little overnight and a revisit of Matilija's upper north fork looked like it would fit the bill quite handily. At just 9 miles for the whole trail, it can be done as a long day hike, especially considering that much of it is a gentle upward slope. Anyway, I'm feeling iffy about some of my equipment, specifically the decade old thinsulate sleeping bag. I also have a breakfast plan that doesn't involve choking down instant oatmeal and some new little neoprene gloves to try. It seemed like a solid test of what the backcountry is likely to send at me in winter, at least if I can pick a day without much weather. I stopped by the Ojai Vons for one last requirement (powdered cider) and found it to be surprisingly cold in the city, then made my way to the end of the road marked "Matilija". A forest service vehicle and a number of other cars were occupying all the obvious non-slushy spots and one more was ahead of me looking for one. It might be a little crowded. I got some off street parking around the rim of the puddle with minimal splashing and got started down the road. Traveling through the first ranch doesn't seem as weird after doing it a couple times. A look up the canyon to be walked. Crossing the creek and then the much larger creek, I got to the sign marking the trail and took a right to start up the canyon. Promptly crossing the creek again, except this time quite dry, I found some of the folks parked at the end of the road having lunch in the middle of the dry creek. A shiny wooden sign gives the mileage to various campsites (1/2 mile to the lower camp, 3 miles to middle, and 4.5 miles to upper, but Maple not mentioned) and the highway (12 miles). Crossing the creek again, the trail seems well used and there are a few rocks that look constructed into benches and have been well used as such. 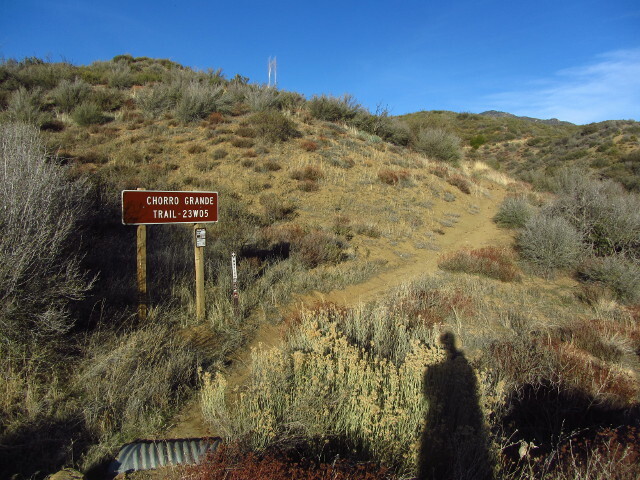 The wide track crosses the stream again and splits into two well used trails, the right hand side delivering all comers into Matilija camp (designated "lower" on the sign), which is a large and well used area with quite a few grills and not enough fire rings for them all. 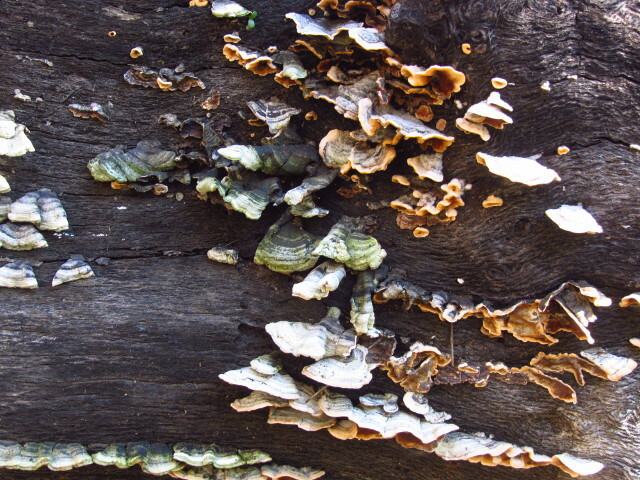 The first of quite a few mushrooms found along the trail are a bit old and slightly mossy. 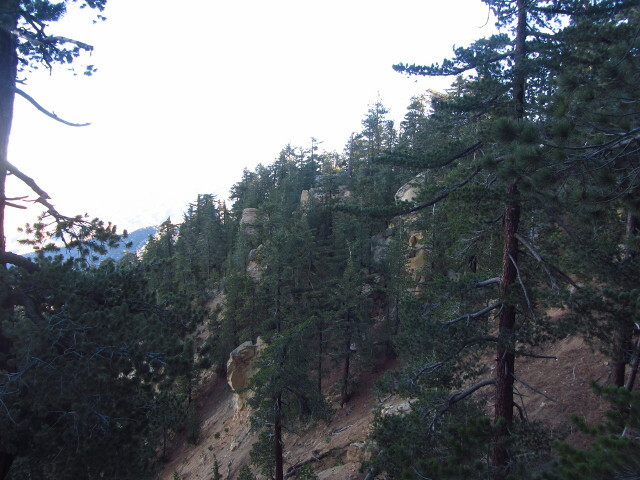 I awoke in Reyes Peak Campground to a morning that was not nearly as cold as I feared. I checked another rock with a shallower bit of water and found it wasn't frozen over from the night. The Whisperlite decided to conk out just before boiling water for breakfast and didn't respond to threats of being replaced with the Simmerlite, but did respond to a second match. I got everything packed up and drove the last few miles to the start of Reyes Peak Trail finding that the mud puddles in the road were frozen from the night before. A difference of opinion, I suppose. For some reason, the main sign at the end of the road had been removed. The information sign has been repaired and even shows the route up the peak now. 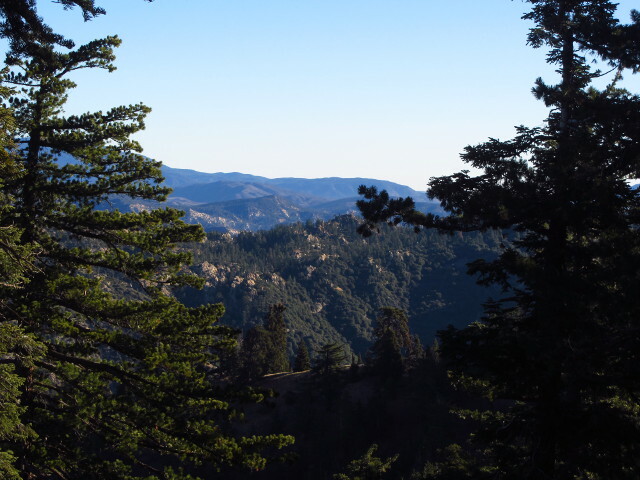 My plan was to take the proper trail over to Haddock Peak and poke around until satisfied, then return coming up the east side of Reyes Peak by the fairly complete use trail for a glorious sunset, then down the more familiar trail in the dark. Marking where the trail first meets the ridge after going around the back side of Reyes Peak with the GPS would make it harder to miss on the way back. It turns out the GPS can be used for non-emergency navigation, too. I read somewhere that the trail to Haddock is 7 miles one way and allotted the water for this length, although maybe a little on the skimpy side. I added in most of my warm stuff for peak sitting, still wearing the light fleece over long sleeved hiking shirt. The long sleeved shirts have been very pleasant as things are starting to freeze, not at all like when I first got them as things were thawing and they were too warm. I packed in the art supplies and food and got started. The section of old road with requisite bits of old pavement to the junction seems shorter each time. Turning down the trail, I found it to be hard in many places and to crunch in others. More signs the mountain is starting to freeze. The north sides of Reyes Peak look plenty steep unless compared to the south slopes of the ridge. 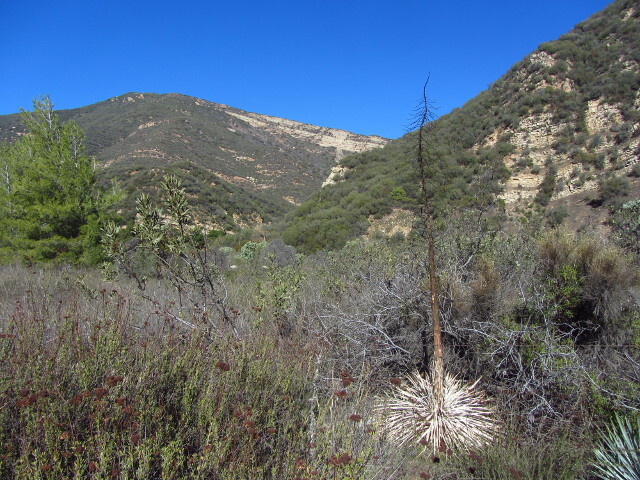 Ridges out to the northeast where Reyes Creek flows. 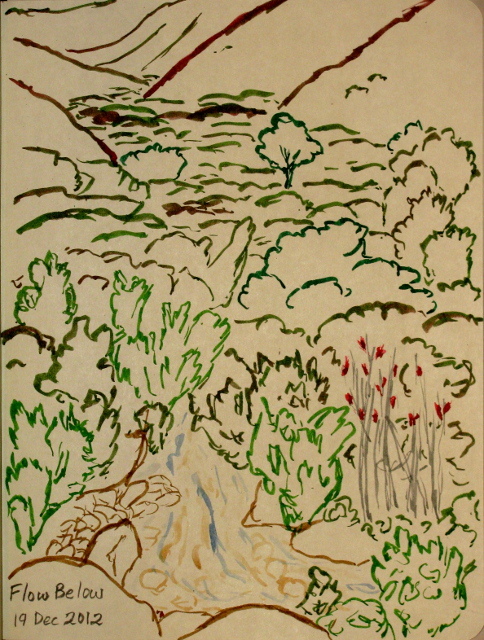 The Cuyama River stretches out below. With the remains of the day, I decided to do a quick jaunt up Chorro Grande to the waterfall to see if it had a bit of water, too. It isn't very far or much climbing. It can probably be seen from the road somewhere, but that would be cheating. Chorro Grande has its sign back! When headed along the 33 headed north, there's a big sign next to a little parking spot that is usually occupied. 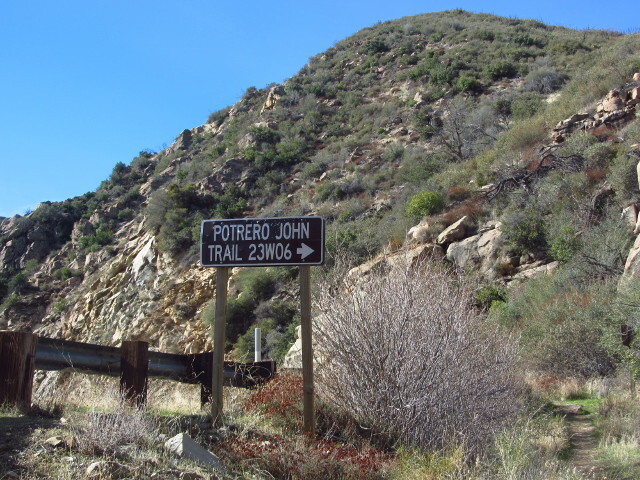 This sign points at a little break in the rocks and, although it looks nothing like a potrero, claims that Potrero John is that way. I've been told that behind this unassuming hole in the wall is a nice little waterfall. 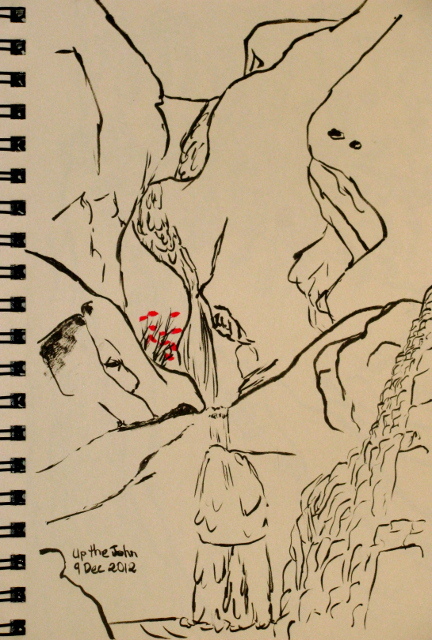 Actually, multiple waterfalls for the enthusiastic, but most only go to the first. An information sign at the start had a lot of out of date details about nearby areas and the important detail that this trail is only maintained to the camp almost two miles up. The start of the trail, as indicated by road signs. One steep walled entry into the backcountry. Starting up the trail, it quickly deposited me into the creek. On the other side, the wilderness starts with its special rules. The trail crosses over the creek a few more times as it makes its way. The canyon at first seems like a box with a flat bottom and vertical sides reaching up about as high as it is wide. It wasn't early in the morning, but the sun still hadn't found its way into the various turns and the air was noticeably chill. 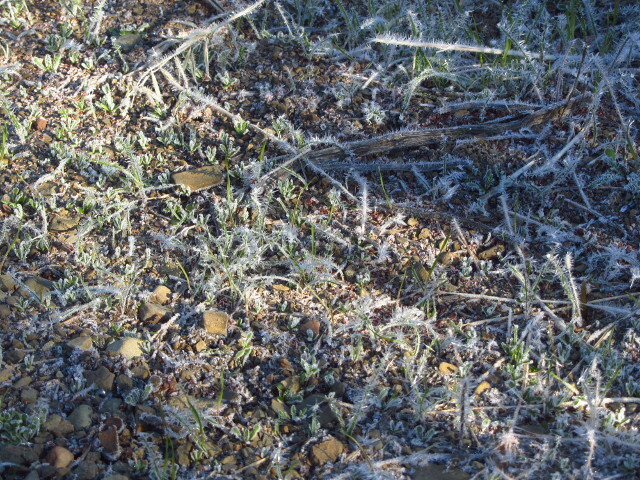 There are a few signs the mountain is starting to freeze. There are a number of illegal campsites along the narrow canyon and I passed a few items in one, then a utility shower in use. 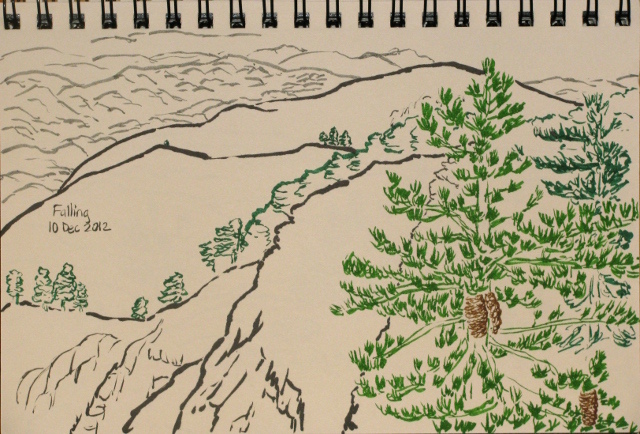 Even on steep canyon walls, pine trees can find a foothold. They stick strongly to the northern slopes here. The canyon opens up into what is presumably the potrero, although I'm not sure it meets the definition. It was pleasantly warm once the rock wasn't hanging close by. A sunny campsite right as the canyon opens looked like the first one that looked attractive. The trail crosses the creek again and finally gets above the high water mark of numerous log jams. Once, when I was poking around the Arcadia REI's backpack selection, one clerk came over and showed off what was the pride and joy of her own collection of gear, the UL45. "And it collapses down to nearly nothing by just pulling the cord, then you can just use the pocket for a day hike" she said, demonstrating what continues to be a very unique compression system. I thought this might actually be a compression system that works for me, but what really caught my eye was that this neatly removes what I see as a design flaw that is repeated across the industry: the compression strap that crosses over the top of the bottom pocket. I don't even use these pockets except for picking up trash along the trail and once for a water bottle when I found I'd left the drinking tube at home, but this detail deeply irks me. A few months later, I decided I wanted a pack devoted to day hikes rather than dumping out my books and pens and using that one. I looked at a lot of day packs that were over 3 lbs. Why would you need over 3 lbs for a day pack? They didn't have anything except tough fabric and lots of padding on the back and more pockets than I had things to put in them. Tough fabric is nice, makes things last. 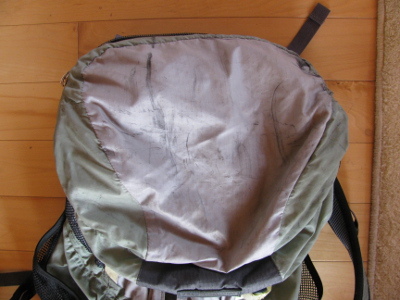 Padding in a day pack, which tend to be frameless, is generally a thick slab of heat that covers the whole back. Pockets are just more fabric. I also noticed the UL45 tucked away in the overstock and discontinued section. A real pack with an actual frame that comes in at slightly over 2.5 lbs. It also comes in a 30L size for day hikes and a 60L size for extended trips, unless you have the poor sense to be a woman. I wasn't completely sold on the notion that I need different shoulder straps, but I decided it would be nice to try for overnights instead of my rather bulky bag that could probably swallow up a fully loaded UL60. Also, the details are green instead of orange, and I don't like orange. The sale price was somewhere south of $50, so it wasn't even more expensive to go for the real pack. It took a while, but that clerk made a sale. Women's UL45 somehow still with all the bits. This is what I got. 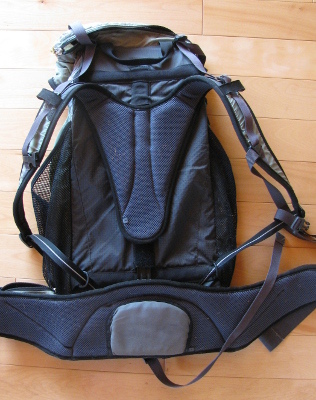 Except for the straps, the back, the bottom, and a tab at the top of tough nylon, it is all sil-nylon. The scrunched fabric in a big X across the bag show where the cord for the very odd compression system sit. It turns out this is just one of few oddities of this bag. 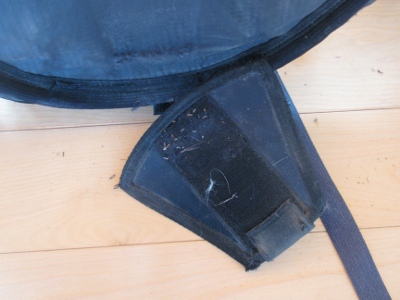 It has a couple mesh pockets on each side, the bottom ones quite deep. It has a pocket on the front with a vertical waterproof zipper. It has a top pocket with another waterproof zipper that is surprisingly large. It has handy small pockets on the belt. All quite nice. Suspension system for the UL45. Flip it over, and there's something strange about the suspension. It has load lifter straps as one might expect, but it all sits on a single stay. 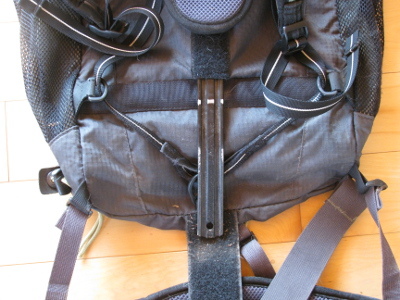 There is a bar and a U at the top to help the pack keep its shape, a bar at the bottom to hold out a couple plastic loops for the strap system, and another U at the bottom to help spread out the weight sitting on that single stay. The hip belt has a massive bit of padding under the stay and it needs it. Everything is sitting on the bone, but with a light enough load, this seems more comfortable and balanced to me. 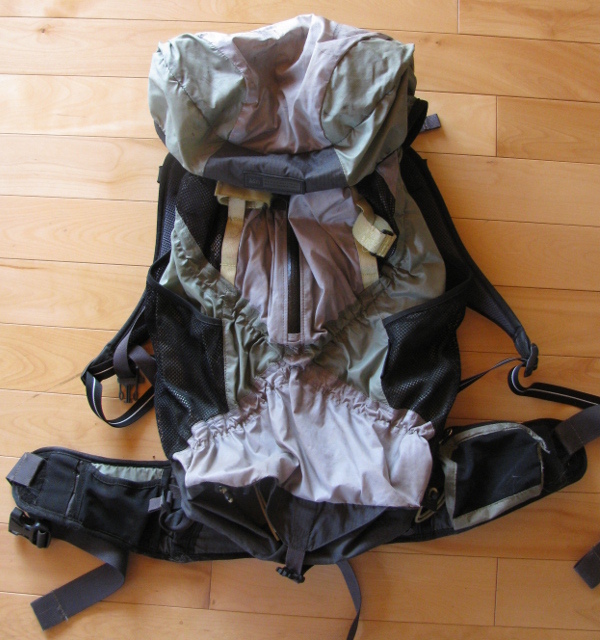 The shoulder straps and hip belt has minimal padding, but it really is intended for lighter loads so this is fine. The sternum strap hits at my neck even at the lowest position, but I never like those anyway. The padding on the back has been left off in a lot of places, but this oddity takes no time at all to get used to if your crew, say, decides it would be a good idea to head for Condor Peak in 90°F. That space is pure airflow. One thing that doesn't stop being odd and not quite right is the way the straps are attached. This system has some name and can be found in other packs. The bottom of the straps are attached to each other and run through loops to hold them out to where they would usually be attached. The bottom can slide to either side a little, allowing the pack to move a bit more with you, and does have its positive aspects. The loops on the side are on somewhat too long leashes and don't pull the base of the straps out as far as I would like. This sometimes gets annoying as the straps slide against my sides. 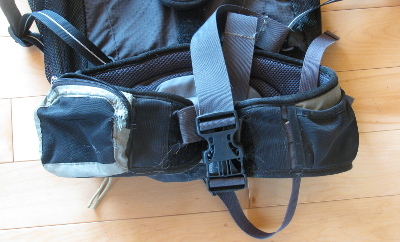 Hip belt of the UL45. The hip belt has a couple of small pockets. On my left, a great spot to stash chapstick. On my right, the perfect pocket for the right camera. It held my old Pentax and my new Canon SX230 but not the old SX110. The zipper has held up to the thousands of picture taking moments. The cloth is failing from wear by swinging arms. The few elastic spots aren't holding anything tight anymore. The fit is the usual for REI packs. If I place the stay along my back where it belongs, the hip belt hits at my waist. There are a few people who like it like this, I'm not one. I maneuvered the belt downward with some velcro adjustment and the rest of the funny fit is just more airflow. The torso isn't quite long enough, only going to 17" max, but it didn't come in a large. Apparently, not only do women not need a smaller or larger bag, they also don't have very long torsos. This actually should be long enough for me, but there must be something else funny with the fit. Inside, there is a sleeve for a water bladder. I can even squeeze in two of the Platypus 2.4L bags for those particularly long or hot trips. With the single stay system, the way the pack sits on my back doesn't change any with stuffing in water, something I've found in packs I've had since. Typically, the compression system is cinched down to the water, jackets stuffed into the bottom, food and art supplies in the top, and first aid and bandannas and bug repellent in the top pocket. Sometimes maps and my flattened cup for watercolor in the front pocket. It easily expands out to hold whatever I feel I need to be safe and happy, and has done so for over 1000 miles, quite probably. Pocket for stay detaching from hip belt. So it's no wonder that it is about to have a major failure. I noticed a couple hikes ago that half the stitches were out of the plastic piece that holds the stay at the bottom to the hip belt. I knew when I got it that the lighter weight materials don't last as long. It is a trade-off. This can be fixed, so I'll do that, but as I look over the rest, I see a lot of thin spots. It may be about to disintegrate. Top pocket, holed a few places and still marked by sooty branches. Considering how I've treated it, it should be shredded by now. I have really grown to love this strange pack. At first, I was careful because the fabric is so delicate. Once in a while, I threw it into something I knew I shouldn't and had it come out with no damage. Now I take it for granted as I squeeze through the willows or under tree branches. It is still wearing the marks from Whitaker Peak. A few holes have been punched through the top, a lot of snags are showing. It hasn't been waterproof for a few years, I bet it can be treated with silicon grease or whatever makes sil-nylon again to help that out, even with the holes. So that's REI's UL45. Perfect in summer with the airflow, perfect in winter with the space, overkill for spring and fall because spring and fall are so perfect on their own. When it breaks for good, I don't know what to replace it with. They only made it in 2006. The next year bag returned to traditional design and is heavier. They decided it needs to be made out of tougher fabric and the compression system vanished again. Everyone seems to be going to a single loop stay, which doesn't allow for quite the same real airflow and leaves the water bulging into the wearer's back. And they still generally have a strap across the top of the bottom pocket.